Mark Russell, from the Melbourne Age, talks to us about Scent Marketing as a trend. He anchors his article on the billboard we recently scented in North Carolina. A rare sight, for now… the aroma of grilled beef wafts from this US billboard. IMAGINE driving along the freeway and suddenly getting a whiff of what smells like a grilled steak. Welcome to scent marketing, a concept proving popular with an increasing number of businesses. 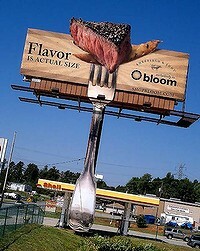 America’s first scented billboard, depicting a towering fork piercing a giant piece of meat, has been erected on the River Highway in Mooresville, North Carolina, pumping out the smell of grilled steak to promote the Bloom grocery chain’s new line of beef. A high-powered fan attached to the base of the billboard pole disperses the aroma of black pepper and charcoal by blowing air over cartridges loaded with fragrance oil. Another US company, ice-cream chain Emack & Bolio’s, has also boosted sales by setting up an “aroma billboard” sending out the scent of waffle cones to attract customers to its store in the Hard Rock Hotel in Orlando, Florida. The company behind both billboards, ScentAir, says it’s only a matter of time before we see similar signs in Australia. ScentAir’s Terry Jacobson said the power of smells could not be overestimated. Certain smells could bring back pleasant memories. In a shop that might make customers look at a product for much longer than they normally would, increasing the likelihood of them buying it. Scent marketing, the subject of an international conference in Miami next month, has become so popular that companies are developing and trademarking signature scents, including beer-scented darts, lavender-scented tyres and fresh cut grass-scented tennis balls. The Kumho Tyre Company says its lavender-scented tyres, which cost up to $330, have been a success in Australia and overseas. The Ecsta DX Aroma tyre is designed for “trend-setting, fashion-conscious drivers”, the company says. The scent – lavender, with hints of mint, iris and white musk – can be smelt within 10 metres of a vehicle. It lasts for about a year and is most noticeable immediately after normal driving, when the tyres are warm. In Japan, the Matsuzakaya department store releases different scents into the air at various times of the day. Stimulating scents are released to invigorate shoppers earlier in the day and soothing scents for weary shoppers are released later. Alex Cosic, from Australian firm Air Aroma, estimates more than 200 companies in this country are using scent marketing, spending up to $10 million a year. Officeworks is trialling a coffee scent at its South Melbourne store, and the organisers of the Melbourne Food and Wine Festival plan to diffuse the scent of chocolate through Federation Square in March next year. “In business we always speak about differentiation, innovation and competitive advantage . . . that’s what bring success,” Mr Cosic said. “So in order to succeed, brand managers are looking for innovation that will differentiate their product from other brands.